I first noticed Marianne’s speaking skills when I was a kid hanging around with Manly P. Hall at the Philosophical Research Society. I watched Marianne grow wings as her lectures became popular, and I smiled when she flew the coop leaving the hen house clucking. I lost sight of Marianne after that, until I saw a story in the L.A. Weekly about Project Angel Food. Having been brought up by untamed former hippie radical queer men of the San Fernando Valley I had already lost friends to AIDS. Ronald Reagan helped create a silence around AIDS, with the stigma of a gay disease as a punishment inflicted by a wrathful deity. 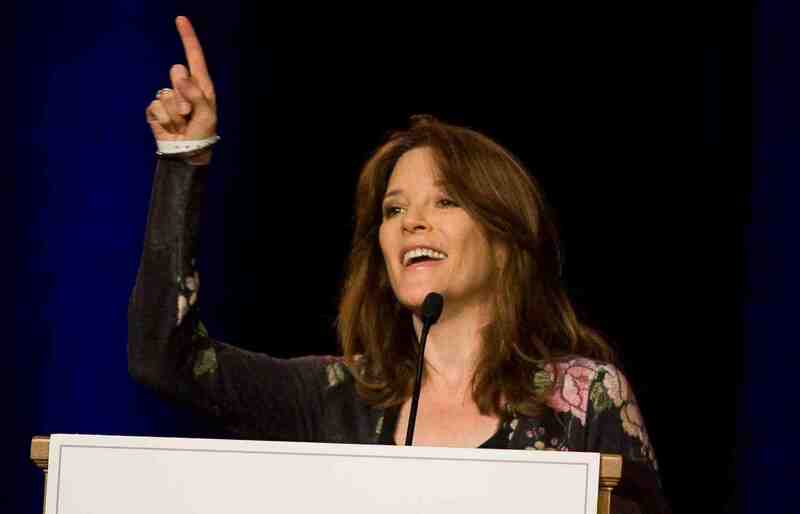 Marianne Williamson served a deity of love instead. She organized a meals-on-wheels program for homebound AIDS patients but she was giving them more than food. At a time and place where the slogan Silence = Death was born she helped bring hope and comfort to those dying forgotten. The Project Angel Food table at my local market allowed me to remember my lost loved ones in a constructive way by donating food and necessities every week I knew they would have wanted. As a riot grrrl zine writer in the ‘90s I always wanted to interview Marianne about Project Angel Food. I’m delighted to interview her now for Newtopia. What drew you to the Philosophical Research Society? Do you have a Manly P. Hall story? No, I was just one of many people who often listened to him speak in the auditorium at the Philosophical Research Society. He was a remarkable person and his books meant a lot to me. Your book The Law of Divine Compensation brings hope to people who have been wiped out by the recent financial calamities tearing through the world economy. What is your best advice for people who find themselves without jobs fearing for the future? The mortal world is a world of scarcity, but the spiritual world is a world of endless abundance. We attract abundance with every thought of love, and we deflect it with every thought of lovelessness. The problem most people have is that they meet limited circumstances with limited thoughts: “Ain’t it awful,” “I’m a victim,” “It’s going to take forever for the economy to recover,” “There are no jobs for people like me” — as well, as “Damn the rich,” “Damn the poor,” all of that. Miracles flow only through loving thoughts, so loveless thought deflects the miracle. So many of us right up to the end of the ‘90s felt like the wind was filling the sails of reform, and then the Bush administration took office and not long after 9/11, two wars and financial crisis put us all into post traumatic stress. 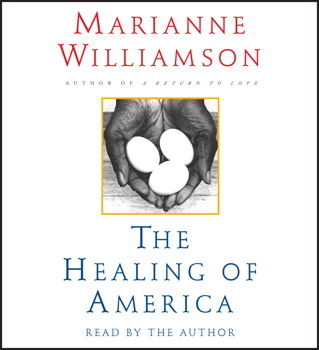 Your book The Healing of America published in 2000 was about the obvious next step in our collective psyche, and it still applies, since the principle is sound, that we as citizens are responsible for healing our republic. What was your reaction to the unexpected right turn that was the first decade of the new millennium? Do you think we’re back on track? Well, let’s not kid ourselves about the decade before that. We’ve been moving in a corporatist direction since the 1980’s; while some Presidents drove it, none of them stopped it. And absolutely we’re not back on track! Especially since the Citizens United decision, we’re now for all intents and purposes a system of legalized bribery. Moneyed sources – from corporations to unions to wealthy individuals – can give anonymously and in unlimited amounts to the advertising campaigns of our elected representatives. In order to get elected and stay in office, most elected officials see themselves as having no choice but to do the bidding of huge economic interests. This is worse than corrupt; it’s perilous to democracy. If financial leverage is what determines political power, then you can kiss the “government of the people, by the people, for the people” part good-bye. We’re living through the de-democratization of the United States. We need a pro-democracy movement. In 1999 you were already warning that you felt the horizon was near when it could be too late to do something about impending but still preventable disasters, including the consequences of economic disparity, the collapse of education, and the environmental crisis. How do you feel about these challenges now? Well that’s not exactly what I said. I believe in miracles, remember. What I said was that we were going to have either a spiritual awakening, or a catastrophe…that something was going to happen to take us back to our hearts. And on September 11, 2001, the catastrophe arrived. Corporations have been villainized in America for generations, yet every business is made of people, and businesses that do bad things do them because of bad decisions people make. Can corporate power become more enlightened in our lifetimes? I don’t villainize corporations; they have an important place in a healthy economy and a healthy society. They just shouldn’t have the rights of personhood, and there should be appropriate regulations on their power. The bottom line for a corporation, particularly since the 1970’s, is short term economic gain for their shareholders. I don’t even think that’s the ethical way to run a corporation, but it certainly isn’t the ethical way to run a country. A country is not a business; we don’t feed our children because it gives us economic gain; we don’t take care of our planet because it gives us economic gain; we don’t provide for our elderly because it gives us economic gain. We do those things because they’re the right thing to do! The role of the government is to balance individual (and corporate) interests with a protection of the collective good. A corporation whose only goal is to increase economic benefit for its shareholders has no soul, it has no conscience. Its success is predicated on financial gain, and people who run the corporation have a fiduciary responsibility to serve that bottom line. The government, then, should be a mitigating force that protects the common good against encroachment by corporate excess. Sister Giant brings women and our spirituality into politics, for more compassion and common sense in our policy-making. What would you like to see Sister Giant accomplish? I’d like to see more women run for office, but more importantly I’d like to see women entering politics to make a stronger stand for our children and for the earth. The United States has a 23.1 per cent child poverty rate; we’re second only to Romania. One in five American children are food insecure. We don’t have air quality safety standards in America’s public schools, and 30-40 % of our students and teachers are already thought to have adversely affected respiratory systems because of it. And 17,000 children starve on this planet every single day. In every advanced mammalian species that survives and thrives, a common characteristic is the fierce behavior of the adult female of the species when we senses a threat to her cubs. Among the hyenas, which is a female dominant species, the adult females encircle the cubs while they’re feeding and don’t let the adult males get anywhere near the food until the young have been fed. Surely the women of America could do better than the hyenas. What is Results working on now? With the new economic austerity is the fight against hunger and poverty more dire than ever? With 46 million Americans living in poverty, you better believe it is. Their international conference is taking place in Washington DC on July 20-23, and I’ll be doing a daylong seminar on combining spirituality and political activism. Having been raised by a leftist lawyer father who took you to Vietnam when you were thirteen years old so you could see for yourself “what war was” instead of being brainwashed by the “military-industrial complex”, you grew up to co-found The Peace Alliance which proposes the creation of a federal Department of Peace. 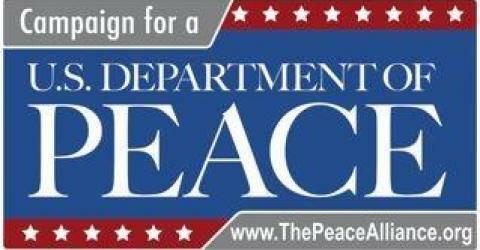 What would people who work for the Department of Peace do to further peace in the world? The idea of a Department of Peace is that there would a cabinet level department within the Executive Branch of the US government whose responsibility would be to research, articulate and facilitate non-violent solutions to domestic and international problems. You can view the Dept. of Defense like a department of surgery, but sometimes invasive measures are not such a good idea. In medicine we want to consider non-invasive options first, and in government we should do the same. We don’t just wait until we get sick, assuming there will always be a silver bullet to suppress and eradicate physical symptoms; rather, we know we need to proactively cultivate health. Similarly, we can’t wait until violence arises and then just incarcerate or bomb the offender; rather, we need to proactively cultivate peace. In medicine we’ve embraced a holistic approach, and we need one in politics too. 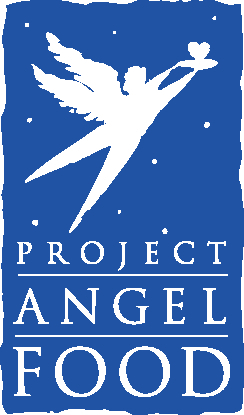 Thank you for Project Angel Food. Did you ever think back in the day when HIV was used to politically stigmatize gay people that in the early 21st century state after state would legalize gay marriage? AIDS was a life and death issue. At the time, legalized marriage would have seemed a small issue in comparison. Please name the two most influential people in your life, one past, one present, and why. One is a spiritual entity, and one is my daughter: both because I love them. Do you have a favorite prayer? Dear God, Please use me. Amen. What is your favorite dream (that you’re willing to share)? You got me on the “willing to share” part. Sorry!